What Are Your Corporate Video Needs? Corporate videos are one of the most efficient ways to communicate your brand’s crucial messages, both in public company promotional videos and internal company videos. Done well, corporate films can meet the unique needs of each company. An internal company film educates employees about the nature, purpose, and procedures of your corporation. Clear, simple communication is key, but so is engagement and style. As with all communication, internal videos have to consider the viewer. Corporate training videos that hit all the right points but aren’t entertaining won’t hold attention, and ones that aren’t memorable won’t effect change. The same principles apply to a commercial video, or any other kind of promotional content. An excellent, creative commercial production can change the whole game for your company. Promotional video for business is a no-brainer in the age of digital content. You need a promo video to introduce your company, explain what you do, and catch people’s eyes. But there’s more to consider when you start working with a corporate video production company. If you want to stand out and be truly understood as a company, you don’t just need an average corporate videographer. You need a true film production business. A corporate video company should believe in what you’re all about, because it’s impossible to fake passion. Good company videos check all the boxes. The best corporate videos think outside the box. Creating a high quality corporate production is about more than not making mistakes, it’s about creating something excellent. The saying is that content is king, but we tend to side with Pixar, who always say that Story Is King. If you want a quick click, you can fill someone’s head with info. But if you want your corporate film production to create a lasting bond with an employee or consumer, you have to touch their heart, and you can’t do that with info. You do that with storytelling. We believe in using the tools of filmmaking to tell your company’s story to the world. That’s why we like to think of what we produce as films, instead of videos. A corporate video company should have a good track record and be easy to work with. They should be excited about working with your company and believe in what you’re all about, because it’s impossible to fake passion. Most importantly, their corporate video production services should create promotional videos for businesses that you want to watch over and over again. Choosing a corporate video maker is one of the most important steps in taking your company to the next level of brand awareness and internal efficiency. Make sure you’re working with the best. Audiences can tell when something is disingenuous. Jesse O’Hara at Companion Pipes clearly loves his craft, and video as a medium is uniquely able to capture this authentically. Dayspring Christian Academy is a small private school, that uses video to communicate its core mission – fostering young minds to impact the world. 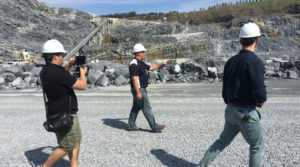 Instead of focusing on all their products and services (like all their competitors), Rohrer’s Quarry emphasized what makes them different – it’s all about family. At LampHouse, you’ll hear us say we create “films” rather than video. We believe “films” captures the essence of these principles that make videos unforgettable. A video studio can boast in all the latest bells and whistles, but if they don’t have the right creative priorities, you risk creating a less engaging video. Whether with LampHouse or otherwise, we hope you partner with the right creative team that has its priorities straight.